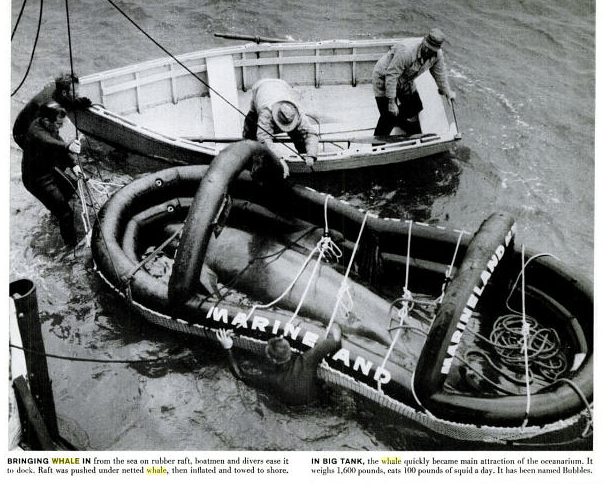 On this day in 1957 a small fishing vessel returned victorious to the Palos Verdes Peninsula in California. After months of effort, her crew, a rugged bunch of media-described “sea cowboys” had just done something nobody had ever done before: they brought back a live whale to be put on public display. The young female pilot whale (Globicephala macrorhynchus), named Bubbles by the crew, would become the main attraction at Marineland of the Pacific, at the time, the world’s largest oceanarium. Bubbles would also launch a multi-billion dollar entertainment industry based on performing marine mammals that continues to this day. Bubbles was immensely popular. Her capture was such an extraordinary feat, it was covered by every major news outlet in the US and Canada. Later, her performances drew eager crowds and her first anniversary in captivity was occasioned by a full-page photo spreads in several magazines. She even made a cameo appearance on television’s Sea Hunt, with Lloyd Bridges. As well, her capture made her captors famous. Veteran sea animal collectors Captain Frank Brocato, Frank (Boots) Calandrino, and Bene (Benny) Falcone were quickly inundated with offers and requests for films, interviews, documentaries, and television appearances. And of course, there were requests for whales. Now, it seemed, everyone wanted one. And so it was that a worldwide open-season on the collection of whales for entertainment was launched. I’m currently working on a pitch to write a full-length feature about Bubbles, the sad story of her capture, and the performing marine mammal industry that grew up around her. But I thought it would be nice, on the anniversary of her capture, to introduce you to her proper. I assure you, Bubbles’ first year did not go as nicely as that clip would have you believe, but hey, that’s entertainment, right? Finally, if you have any ideas for where to pitch this story, I’m all ears. It is a sad story, and when you think of the intelligence of these animals that allows training them for minor tricks, it becomes even sadder. If you have access to photos, I would suggest a kids book proposal on this story. The only one I could find was one from 1963, and it likely (just looking at the cover) was a prettied up version of it. What happened to Bubbles, by the way? When do we get the rest of the blog? The story by now is dated, but the fact that she was the first likely makes the story. Love that newsreel grit: real journalism in action. It’s so sad to see such amazing and intelligent animals exploited just for our entertainment. I would also like to know what happened to Bubbles, does the oceanarium still exist? As I mentioned, I am going to write the full account of Bubbles and the marine mammal industry of that time (and maybe to the present). I’ve done lots of research and the one piece of information that has been surprisingly hard to get is exactly what you both have asked for: What happened to Bubbles? As near as I can tell (and I have nothing concrete to substantiate this) is that she died at Marineland of the Pacific between 6 and 10 years after her capture. It also appears that after her death, her tankmate, Bimbo, was set free. I’m cautious about stating those things as fact because famous animals like Bubbles are frequently replaced by animals of the same name. In fact, there is still a Bubbles at SeaWorld today — possibly Bubbles the 3rd. In answer to your question Sam, Marineland of the Pacific was purchased by the owners of SeaWorld San Diego in 1987 and was subsequently closed. I am under contract with a publisher to write a book called ‘The History Of Florida Marine Attractions’. 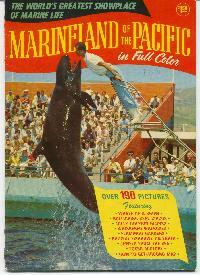 Marineland of Florida were part-owners of Marineland of the Pacific which made history in 1957 when they captured ‘Bubbles’. Marineland of the Pacific flew out pilot whales to Marineland of Florida and Marineland of FLorida flew bottlenose dolphins to Marineland of the Pacific. ‘Bubbles’ which is residing at Sea World today was captured in 1966. In her book, ‘Lads Before The Wind: Adventures In Porpoise Training’ Karen Pryor states that ‘Bubbles’ was actually a series of thirteen pilot whales that lived and performed at Marineland of the Pacific from 1957 to its closing in 1983. It is my understanding – according to Marineland of the Pacific press releases – that the ‘Bubbles’ still alive today and living at San Diego’s Sea World was captured in 1966. Like other oceanariums, Marineland always kept ‘back up’ animals that were trained to fill in when the star performer suddenly died. Karen Pryor herself would make an interesting subject – she was the first Director of Training for Hawaii’s Sea Life Park when it opened in 1964. Today she is renown for her books about training dogs. Thank you Greg. I just ordered Pryor’s book (.01 +shipping on Amazon). How’s your book coming along? I don’t know what year it was, maybe between ’65 and ’67, but one of the Bubbles cracked her head against one of the panes of glass during warm-ups for her performance and the park had to be evacuated. Summer of ’66, I was 7, and one of the many screaming kids that ran from the rush of water that came from the broken window. About half the tank emptied. I once had a tiny article from the Bakersfield Californian newspaper about the event, but it’s long gone now.